There are many benefits to utilizing a CUB. The CUB removes the need for spotting, as its automated system removes the potential for human error, and accurately positions each car an exact predetermined distance, unlike locomotives and trackmobiles. The use of a CUB simplifies any loading and unloading operation as it takes only a single person to operate. The CUB is track is bolted directly to the existing rail ties, making it easy to install in any facility. 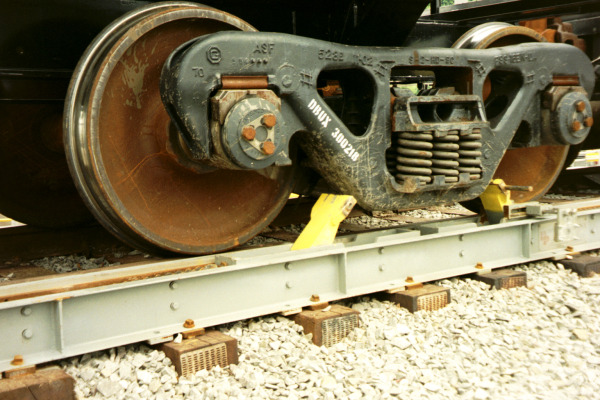 Two pivoting claws securely hold the railcar’s truck frame, and a chain and sprocket assembly propels the car in either a forward or backward direction. The CUB is powered by a variable speed motor installed adjacent to the track. The CUB is a safe and efficient way to position railcars. Many other railcar movers utilize hydraulics which can increase the amount of necessary maintenance and open up the facility to the risk of a hydraulic leak/spill, which can be very costly to reconcile. The CUB’s electromechanical design requires less maintenance, and is a safe addition for grain elevators or any rail loading/unloading terminal. The CUB is an ideal solution for small to mid-sized railcar loading or unloading operations. It has successfully replaced less efficient railcar movers in variety of plants and terminals handling fuel, chemicals, sand and a variety of ag products. To learn more about Heyl & Patterson’s railcar moving capabilities, please download our railcar movers brochure.